A Traditional Father/Daughter Story, Only They’re Vampires! Every father of a daughter has wished at some point in his life to keep his little girl well protected from the world and the wrong guys in a remote castle in the middle of nowhere for 118 years. 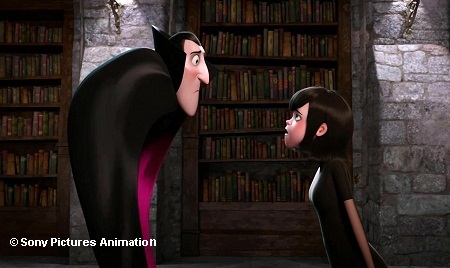 “Hotel Transylvania” is an animated feature about a father, who happens to be Dracula, voiced by Adam Sandler, who does exactly that to his daughter Mavis, voiced by Selena Gomez. 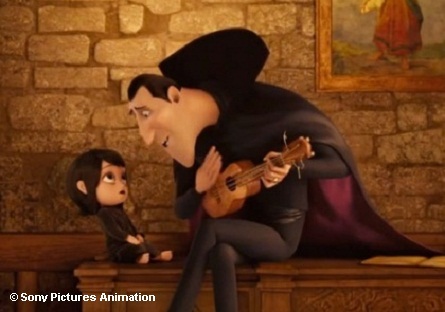 Dracula is a single father to Mavis. The story begins in the year 1895 where Dracula is unexpectedly forced to be a single father and raise his baby girl Mavis after a tragedy takes his wife’s life. He builds a huge castle for Mavis and turns it into a hotel for monsters. His intentions is to make it a refuge for monsters (insects included) where no humans are allowed. Flash forward to the current year, it is the eve of Mavis 118th birthday. It seems to be the equivalent to a human teenager’s 18th birthday. Mavis quickly reminds Dracula that his promise to her on her 118th birthday is that she would get to finally explore the world outside of the castle and even travel to a different country. The castle/monster hotel Dracula build to protect Mavis from the world. Not wanting to disappoint his little girl, he allows her to visit a small village just outside of the castle that same night. However, it turns out that the village is not real. It is made of multiple facades with Dracula’s zombie workers disguised as humans who scare Mavis away by using fire and threatening to kill her. Her curiosity of humans is put to rest by the experience. But, when she meets a mystery young male drifter named Jonathan who stumbles into the hotel claiming the identity of a party planner for her birthday who is Frankenstein’s cousin – John Stein, Mavis feels a certain “zing” with him that she just can’t shake. At the end, his true identity is revealed in the worst way – under the scrutiny of the hotel’s monster guests as well as Mavis who is hurt by her Father’s betrayal but is fascinated even more by Jonathan. However, upon Dracula’s wishes Jonathan exits the hotel to continue his travels. Dracula says, “I want to kill him. But it would set monsters back hundreds of years”. 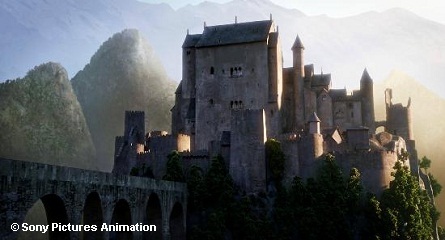 “Hotel Transylvania” is a movie that parents will genuinely enjoy with their children. Though having some plot holes, such as even though Dracula stated early in the movie that he too has kept himself from the outside world away from humans for over 100 years, yet he knows what the word “nerd” means and recognizes the movie “Twilight” when he sees it. Dracula clears up a few misconceptions about vampires – Garlic is not a threat, he doesn’t drink blood – but instead drinks blood substitutes such as “Near Blood” and “Blood Beaters”, Dracula does not say “blah, blah”, and lastly, a stake through the heart is also somewhat of a myth, “who wouldn’t die from that” right? said Dracula. Getting burned-up by the sun – that’s one of the facts of being a vampire. Because of it, Mavis never witnessed a sun rise until she met Jonathan. At nearly 118 years old, Dracula still calls Mavis “honey guts”. A common relatable element of being a parent and being a youth will instantly connect audiences of all ages to this movie. The visuals created for this film accomplish pulling the viewer-in and delighting. 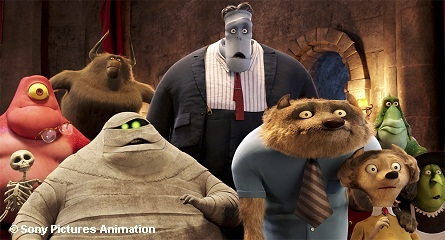 “Hotel Transylvania” is the result of ten years of work by director Genndy Tartakovsky, producers Michelle Murdocca and Adam Sandler that was well paid-off in creating such an enjoyable movie. There is great detail and side treats to deliver a complete story with all of the elements: location, plenty of characters, attention to detail, and creativeness. One of my favorites is the door knockers to the hotel rooms. They are shrunken heads that talk to visitors before entering the room. Roles in the movie were brought to life using the colorful voices and talent skills from: Cee Lo Green (Murray, the mummy), Jon Lovitz as “Quasimodo”, Andy Samberg as “Jonathan”, Fran Drescher is a very memorable wolf who is a balanced mother with a ton a kids (Eunice), and Jon Lovitz as Frankenstein, along with stars Adam Sandler, and Selena Gomez whom, as a singer, sang the song during the end credits for the movie. “Hotel Transylvania” opens in theaters on Friday, September 28, 2012.